Studies of food systems education have largely avoided questions concerning race. In this commentary, we interrogate the racial assumptions behind certain food systems education projects. Food systems educators are often motivated by a whitened cultural desire to "bring good food to others" and see garden-based learning projects, which seek to instill healthy nutritional behaviors, as the solution to the problem of purported food deserts. We argue that food systems education is in need of a critical intervention. In this commentary, we propose critical food systems education (CFSE) as a theoretical framework, set of pedagogies, and vision for policy that moves beyond teaching students about the food system, and helps them realize their potential to structurally transform it through collective action. The CFSE perspective is theoretically grounded in food justice, food sovereignty, political agroecology, and critical pedagogy. The CFSE approach is not merely theoretical, but arises from the examples of grassroots social movements throughout the world that have developed radical forms of food systems education. We highlight this approach using the example of the Brazilian Landless Workers' Movement (MST). The MST opposes a racialized discourse of the "peasantry" as backwards and ignorant. The movement's leaders reject a vision of education that reproduces white modernity, and instead support a vision that advances radical agroecological education programs that train students to be political subjects capable of creating a socially and environmentally equitable food system. 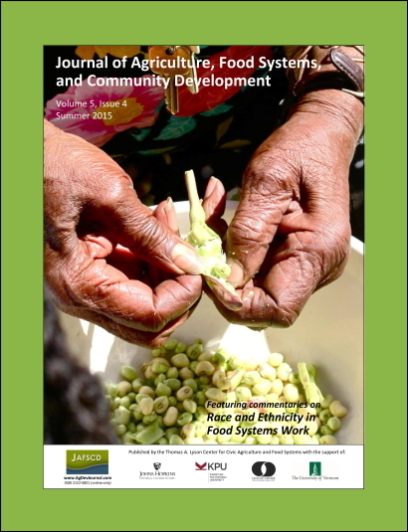 The example of the MST underscores the potential of CFSE as a corrective for the food systems education's racialized assumptions. Department of Anthropology, University of Alabama; 25a ten Hoor Hall; Mars Spring Road; Tuscaloosa, Alabama 35487 USA.